Export data from sql server - Datasparc Inc. 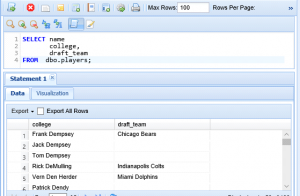 Ever need to get your data from a SQL query, a table, or a view into an Excel file? If you work with databases then you surely have. One of the many useful features of DBHawk allows you to export to Excel file in a few simple steps. No need to copy data from the results grid into an empty Excle spreadsheet. 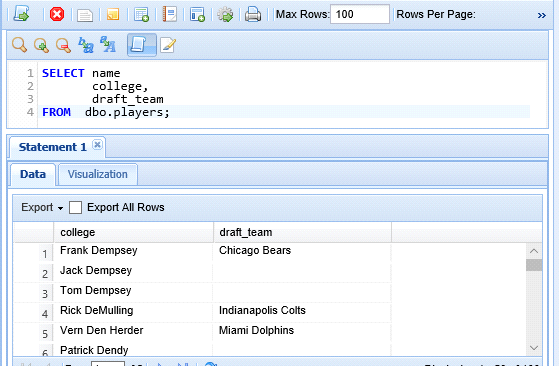 Use the DBHawk user interface to create an Excel file with the data. There are two different areas of functionality within the DBHawk interface that can be used to export. The export procedure is identical in both. 1. Export from the DBHawk Table Data grid (Figure 1). 2. Export from the DBHawk SQL Editor Result Data grid (Figure 2). 1) Locate the ‘Export’ drop down menu above the grid, and expand (figure 3). Click the ‘Export XLSX’ menu item. There will be an ‘Export’ drop down menu and an ‘Export All Rows checkbox. 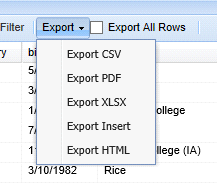 Use the drop down menu to select the type of file to be exported to. Enable the ‘Export All Rows’ checkbox to bypass the maximumRecords setting, if needed. 2) If the number of rows to be exported exceeds the value of the configured ‘maximumRecords’ setting (figure 4), then enable the ‘Export All Rows’ checkbox. 3) When the ‘Export Xlsx Settings’ dialog box appears, enter how NULL values should be represented in the spreadsheet. Click the ‘Export’ button.